This year's edition of the Contractors State License Board (CSLB) California Contractors License Law & Reference Book is now available for purchase or for free viewing online. The updated publication, totaling just over 1,000 pages, provides easy reference to new and amended construction laws that took effect January 1, 2014. 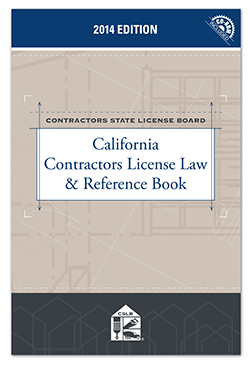 The book's convenient, all-in-one format continues to provide CSLB's history and mission, and specialized sections about becoming a licensed contractor; home improvement; business management; construction standards and safety regulations; California's Business and Professions Code and other construction-related state codes; and complete California Contractors License Law rules and regulations. The 2014 law book can only be purchased from the publisher, LexisNexis, and is not available at any CSLB office. This year's law book includes a convenient CD and costs $27 plus tax, and $10.44 for shipping and handling. Click here to order.